Texta offers feature-rich automation and SMS campaign management tools that are very easy to use. The high variety of features makes Texta just as easy to use for companies that wish to send out marketing messages, appointment reminders, polls, etc. as for non-profit organisations like schools, sport clubs, churches, etc. Setting up an SMS campaign is as easy as 1, 2, 3 using Texta. Just create a list, upload contacts, write a message and you're ready to go. 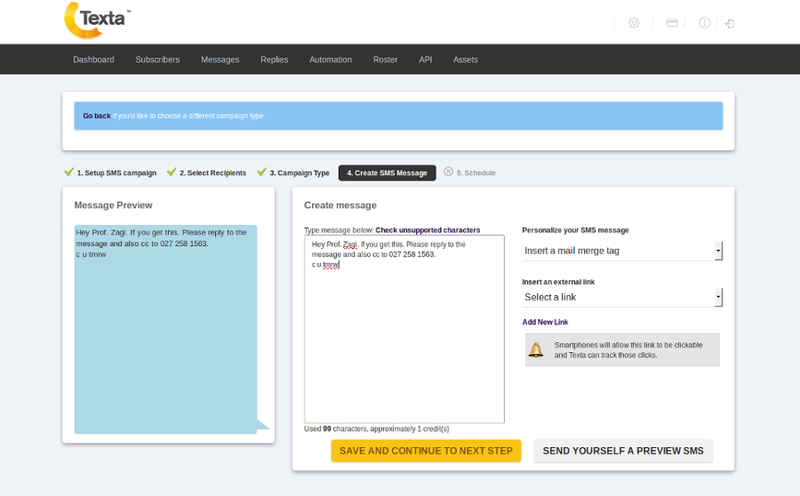 Create personalised SMS campaigns, alert messages or SMS polls using the Texta messaging platform. Messages that carry the first name of the recipient are 85% more likely to have a positive impact on your campaign than just a blanket SMS. Include your customers’ names in the messages you send to increase the effectiveness of your campaigns. Setup your campaigns to be delivered in the future. This way you can future plan your marketing and still have time for other things. You can either set messages to be sent straight away or scheduled at a future date/time. Texta will automatically start sending your messages. View message delivery reports and replies to gain valuable insights into your campaign’s performance. The Texta messaging platform offers unmatched SMS campaign features and benefits to help you reach your target audience in more powerful ways than ever before. With Texta you can automate SMS messages based on a number of pre-defined triggers. For instance, you can setup messages to be sent out automatically based on “today” matching a certain date. Using this type of automation you can send appointment reminders, vehicle service reminders, membership expiration reminders or a simple birthday greeting.You can also define rules within Texta to fire SMS when someone subscribes to your list, or based on criterion defined in your API calls. Read more about the SMS Automation features available inside Texta to explore the unlimited possibilities. Texta offers many different types of campaigns that can take your marketing efforts to a completely new level. Use Texta to send general bulk SMS marketing campaigns to all your customers in a list or if you want to learn more about your customers’ demographics, perhaps you can also run an SMS poll. If you’re running a social enterprise or managing a subscriber base (membership club, church, school or similar) you can also run various automation campaigns to connect with them. Take a look at our SMS Solutions section to see all the various ways you can use Texta to communicate with your customers in ways better than anything else out there. Texta provides a powerful analytics engine to show campaign results in a way that you can use to improve your marketing efforts. With detailed reports about the number of messages delivered (including those waiting to be delivered because the recipient’s mobile phone is switched off) you know exactly how many people you’ve been able to reach out to. Furthermore, by inserting a link to your website (or social media page) inside the SMS, you can capture additional information about your customers’ behavior. Texta will tell you how many people clicked on the link, whether they’re using an Android based phone or an iPhone and where they are located at the time of cilcking the link. These insights can help you tailor your campaigns, your sales pitch and even your website landing pages to suit the behavior of your customers. Texta also has a super simple but extremely powerful developer API, using which any developer can add text messaging capabilities into their own apps. Our simple to use HTTP POST/GET based API calls are available for developers to send bulk SMS as part of an interaction between your own application and the end-user (Application to Person SMS). Our robust APIs allow any developer with minimum programming experience to fire notifications, SMS verifications, welcome messages and standard streamed messages with the APIs. These APIs can also be used to process incoming replies to messages you send using the Texta SMS Marketing Platform. Checkout the Developer section in the support area to see how easy our API calls are to implement.